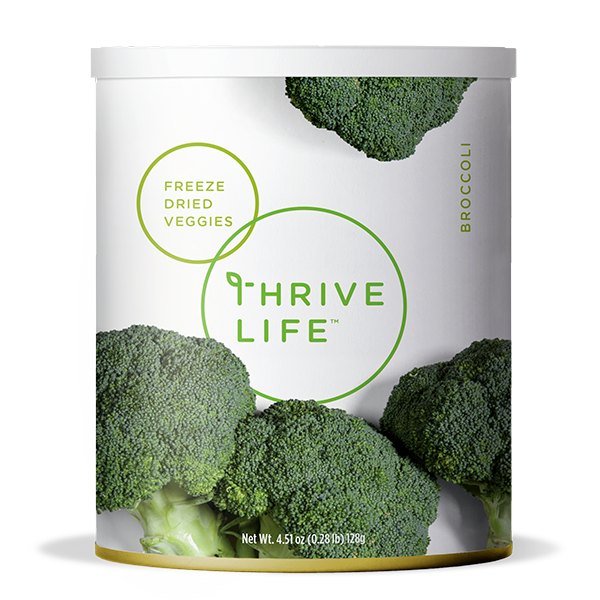 THRIVE freeze-dried broccoli will help you maintain a well-balanced diet and active lifestyle. Each bite-size piece of THRIVE Broccoli is loaded with vitamin K, A, and D, making this green vegetable the perfect addition to any meal. THRIVE Broccoli is already cut and trimmed, so you can quickly add it to your favorite soups, casseroles, salads, and much more! Whether you use it as a tasty side dish or ingredient, the freeze drying process ensures that the freshness and nutrition will last for years to come. Add 1⁄3 cup of water to 1 cup Broccoli let sit 5-10 minutes or until tender. Crumble the broccoli and add it to breading for chicken to hide the veggies for picky eaters.